This photograph was the ashirwaad / blessings to Chavan Babaji from Sai Babaji. Even today if any devotee meditate's with Shraddha in front of this photograph, he gets his desires fulfilled accordingly. 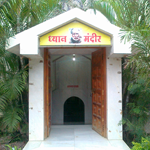 Chavan Babaji recieved his devotees at this place and listen to their queries accordingly. He recieved each devotee with warm wishes and humbly gave them blessings of Sai Baba. 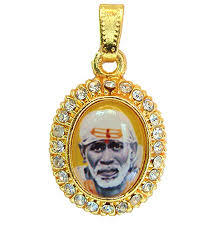 He was a man of simple character and was a true devotee of Sai Baba. 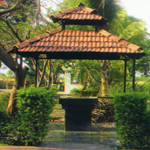 aidham is situated off kopargoan - Manmad highway. 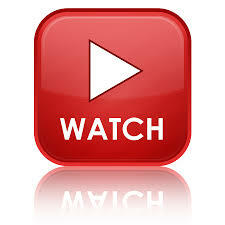 Its around 1 Km from kopargoan railway station. 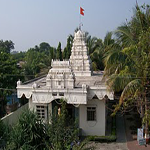 Saidham temple was established here on 16th June 1999 by pujya Dhondirambaba chavan. The building work was completed in 1 year with the blessings of Shri Saiababa. This was considered to be one of the miracles. The people working at the temple site experienced various Chamatkaras during these year . Every thursday Dhuni is lightened through out the day, any devotee can take UDI from it for blessings. This is a sole place at Sai Dham were one can meditate with full devotion and find peace. 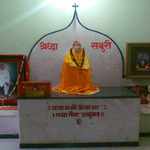 This place is truely blessed with Sai Baba's darshan in form of his face on one of the wall. 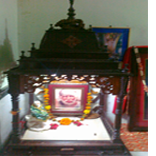 SHREE SAI SACCHARITRA PARAYAN SOHAL is being done here every year between Gudipadwa and Ram Navmi.